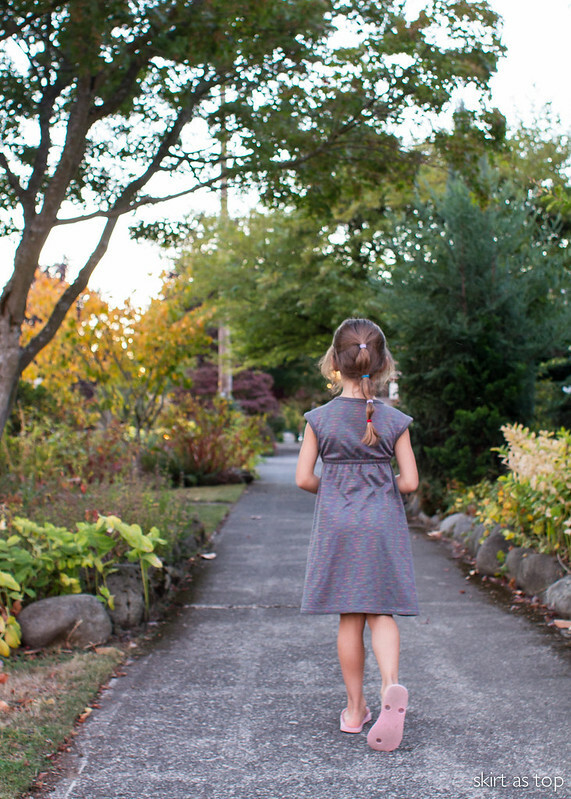 this is E’s “back to school” dress and i took these pictures last fall. i feel like i need to give you that disclaimer lest you think we’re all tan and wearing flip flops around here in january. no. the photos are seasonally out of date, but since this is E’s favorite dress of the moment, i couldn’t skip blogging it! JoAnn Fabric has really upped their apparel fabric game lately. i’ve been finding a lot of great knits, in particular, and we all know how hard good knits are to come by. this one is a poly blend of some sort, and it’s a double layered fabric (like a double gauze but for knits). it has rainbow stripes on one side, and rainbow polka dots on the other! i used the dots for the pockets and the armhole/sleeve bindings, and the stripe for the main. when i saw it, i knew E would be a huge fan, which of course she is. 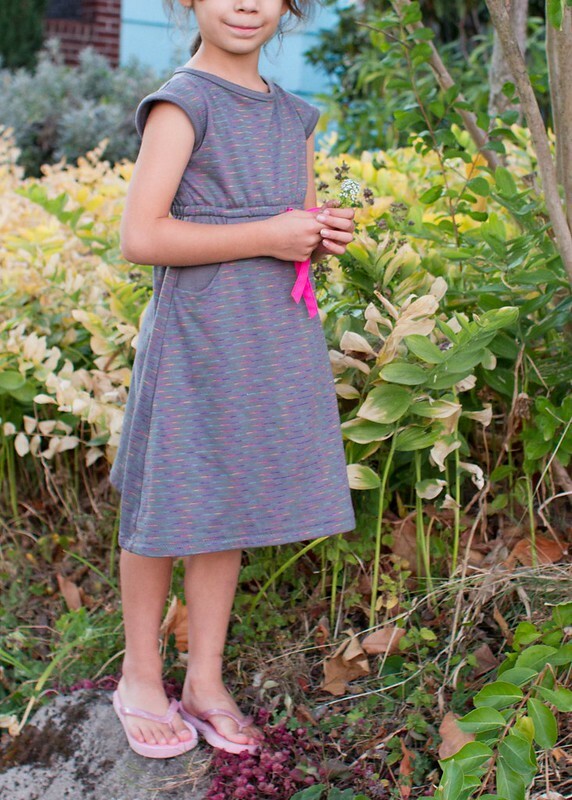 the pattern is craftiness is not optional’s lulu dress. pretty sure i made a 4T with added length again, it’s been a while so i can’t exactly remember. great pattern, so quick to make and easy to wear, and you can make it with a knit top/woven bottom, or all knit! i hadn’t tried the all knit version until now, but it is definitely nice to never have to worry about wrinkles! i under stitched the pocket linings and zigzagged the neckline binding, armhole binding, and the hem. the tie is a piece of fuscia bias tape. E has worn this dress so, so much in the past few months. she now wears it with leggings and a sweater – any time it’s clean she chooses it. it’s gotten a bit pilly after many washes, but not too bad. there’s something about blogging a project after months of use – it’s harder to remember the sewing details, but nice to have the history of whether it was a successful project from a use and longer term wear standpoint. this one was definitely a success! Too cut! I made my girl some mini hudsons in the black version of that fabric! They were very well loved! Oh I love that fabric. Maybe I need to be checking out Joann’s again! And these pics make me long for summer!! I thought you were on a tropical vacation and I was very jealous! Great dress, knit dresses are worn a lot more than the woven ones at our house. This one deserves to be a favorite. Haha I wish we were – but spring feels like it’s on its way here, so that’s good. Thank you!! So, so cute! 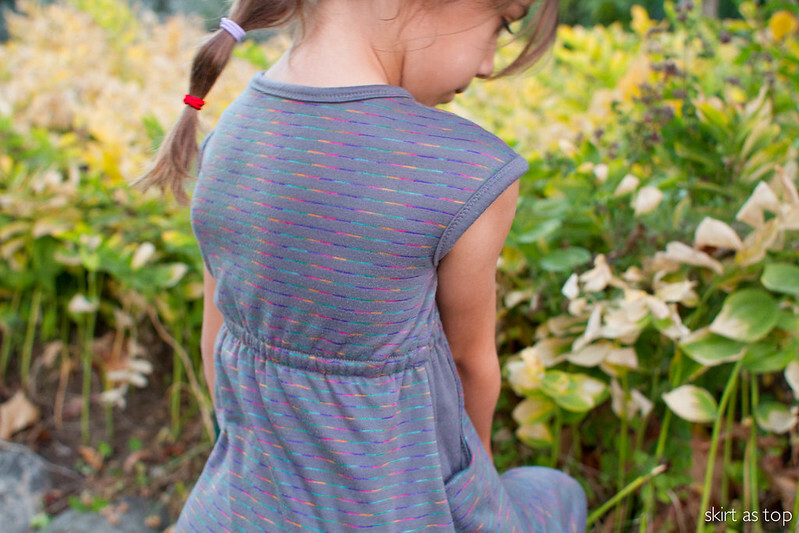 I just spotted this fabric over the weekend, but didn’t buy any… Love the rainbow stripes! Isn’t it fun? As soon as I saw those rainbows I knew she’d just love it. 🙂 I’m glad they still have it! That fabric is so great! I’ve always wanted to try the lulu, it’s so cute. When short sleeve weather returns I’m gonna do it! Yes, do!!! They get a lot of wear and are quick/fun to sew too. What a great dress, Kristin! I’m so glad you blogged it. And also that fabric is amazing. You’re right – JoAnns apparel lines have really improved recently. I’ve been disappointed in some of my indie knits. There’s a lot more variation there than indie wovens. Some of mine have shrunk dramatically or faded a lot. Fading seems to be a pretty constant problem for me with indie knits, especially in the brighter and darker colorways. Thanks Rachel! It’s especially hard to buy knits online I think. So much inconsistency. I feel like knits are always a bit of a gamble though, you know? Sometimes they feel great initially but pill up after one wash, some shrink too much, some fade…arg. Even expensive ones aren’t reliable! The selection is so much better than it used to be though! 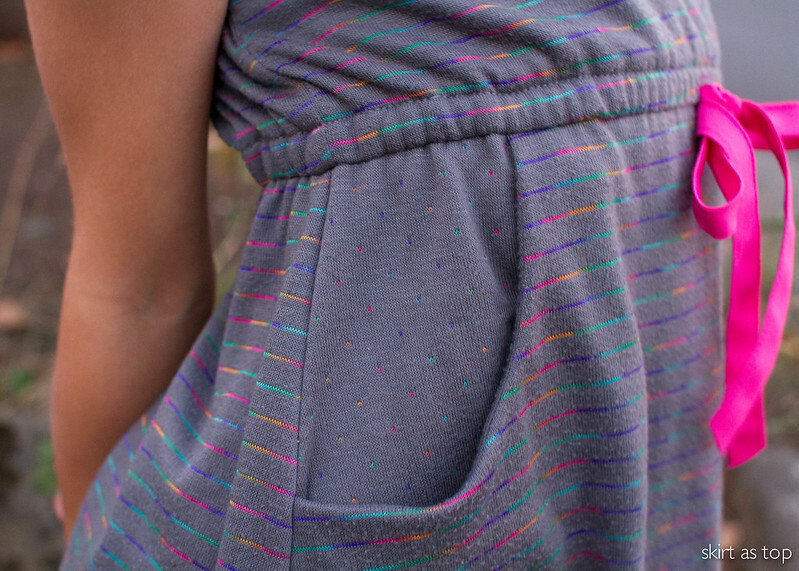 It’s the perfect knit dress- the Lulu is definitely one of my favorite patterns! And you are so right- Joann has really up’d their game lately! Love this so much! That fabric is a great score! My girls both loved theirs, such a comfy dress! So cute!! I love this fabric! I would shop at Joann’s more if it wasn’t clear across town from me in the worst possible direction! I agree, I’ve seen more and more good apparel fabrics there, although I remain loyal to my (closer-by) local fabric stores. I agree, knits can be a bit of a gamble – often the most expensive ones fade the most (especially the organic knits, I find). But I’ve found a few online knits I always know I can rely on, like the Laguna jerseys. What beautiful fabric, no wonder she loves it. Great work. 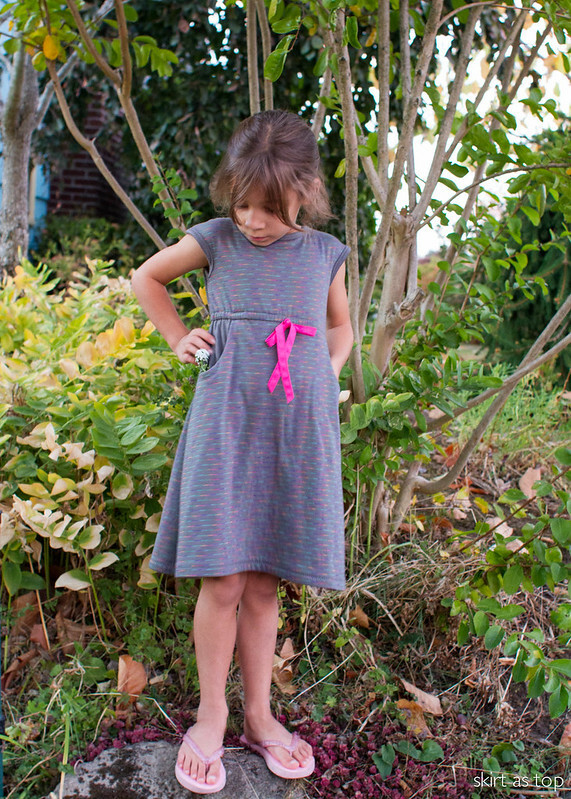 this dress looks SO comfy, i love sewing successful things that the kids love! The dress is adorable….I can see why she loves it! I can’t believe this fabric came from Joann! Now if they would just carry cute non poly knits……I get enraged over nice sewing projects going pilly. Haha. This dress is really so adorable on her. The shape of the pattern works well on her and her strong little body. Hehe.